There are the obvious legacies associated with Walter O’Malley, the businessman, lawyer, baseball executive and family man. 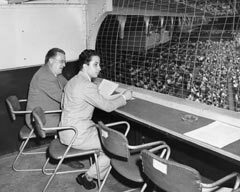 But throughout O’Malley’s life, the innovating spirit that envisioned the construction of Dodger Stadium conjured other grand ideas about his country’s “national pastime” from Southern California to all parts of the globe. If the sports world was O’Malley’s oyster, baseball served as his pearl. The Dodgers joined the National League in 1890 and the 60 years preceding O’Malley’s arrival as team president featured occasional international interludes. The first Cuban big league pitching star, Adolfo Luque, made a brief stop with Brooklyn in the 1930 and 1931 seasons. The Dodgers operated a Triple-A affiliate in Montreal and they held spring training in Cuba (1947) and the Dominican Republic (1948) before settling in their current Dodgertown headquarters in Vero Beach, FL. The Dodgers, already a popular franchise in America when O’Malley became its leader thanks to on-field success and memorable personalities, would become recognized throughout the world as one of the major league’s most stable and progressive franchises. During the next two decades, the Dodgers used their regular-season ballparks — Ebbets Field in Brooklyn and later Dodger Stadium in Los Angeles — as destinations for their growing list of foreign dignitaries. 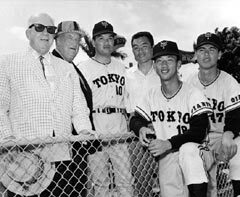 The team’s goodwill tours of Japan following the pennant-winning seasons in 1956 and 1966 led to spring training visits to Dodgertown by the Yomiuri Giants in 1961, 1967, 1971 and 1975. 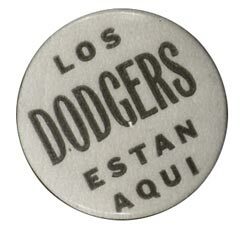 In his first year as Dodger President in 1951, O’Malley invited representatives of the Venezuelan League’s Cerveceria Caracas club, along with 400 Venezuelan cadets, to be guests of the Dodgers while the party was in New York to celebrate Simon Bolivar Day on April 19. It would be the first of many O’Malley invitations for international visitors to Ebbets Field. When 75 Israeli sailors visited Ebbets Field in June 1951, O’Malley sent them home with a batch of baseball equipment. By 1952, O’Malley proposed a world tour with the American League’s Cleveland Indians. Commissioner Ford C. Frick announced on the eve of the All-Star Game in Philadelphia that major league owners had granted authorization and the State Department was enthusiastic about the plan. The owners also relaxed a rule that usually prohibited barnstorming tours. The tour didn’t materialize, but the plans fueled discussions for other ways to promote the sport among other nations. By the time the Dodgers clinched their first championship following a thrilling seven-game victory over the rival New York Yankees in the 1955 World Series, O’Malley’s mailbox was stuffed with many international postmarks. On Dec. 2, 1955, O’Malley sent the following letter to His Majesty King Faisal II at the Royal Palace in Baghdad, Iraq. 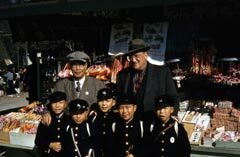 Sotaro Suzuki, a Japanese sportswriter who worked closely with Yomiuri Shimbun newspaper publisher Matsutaro Shoriki, the father of Japanese professional baseball, spent time with the Dodger organization beginning with the early negotiations and discussions regarding the 1956 goodwill tour of Japan. Suzuki visited Dodgertown and Ebbets Field. 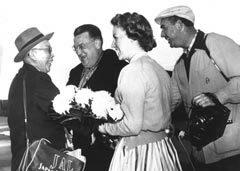 When Dodger Stadium opened in April 1962, Suzuki was a special guest of O’Malley and the Dodgers in Los Angeles. Suzuki marked the occasion by commissioning a stone lantern, which was sent from Japan to Dodger Stadium in 1966. 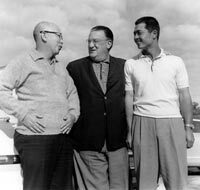 Following the 1956 Japan tour, the Dodgers invited Shigeru Mizuhara, manager of the Yomuiri Giants, along with pitcher Sho Horiuchi and catcher Shigeru Fujio to train in Vero Beach with the Dodgers. In 1961, the Dodgers invited the entire Yomiuri Giants team to train at Vero Beach. Suzuki served as an interpreter on the Vero Beach trip in 1957 and later penned an essay about the Giants’ reaction to the American training camp. One of the players asked if every major league team had the same spring training format as the Dodgers. “I responded with a grin and explained that Dodgertown was exceptional,” Suzuki wrote. “Only the Dodgers had such a unique setup whereby they were able to train their 11 minor league clubs right along with their parent club, and the Tokyo Giants, too. Their system of training is very different from other baseball organizations and much more expensive. But this routine proved very successful with the development of such stars as Craig, Drysdale, Koufax, Podres and Williams in the pitching department ... Camilli as a catcher ... Gilliam, Hodges, Larker, Neal and Wills for the infield ... and Snider, Demeter, Davis and Howard in the outfield. In 1962, Japanese baseball coach Kaoru Betto traveled the entire season with the Dodgers, studying the American method of training and play. The Dodgers also extended a spring training invitation in 1962 to Bowdewijn Maat, an outstanding amateur player from Holland who wanted to observe the Dodger organization. Dodger minor league manager Pete Reiser visited Japan in the fall of 1963 to coach the Tokyo (Toei) Flyers. In 1965, the Dodgers sent two of their leading scouts, Kenny Myers and Tom Lasorda, to Japan to coach the Yomiuri Giants during two weeks of their spring training. When the Mexico City Tigers wanted to groom one of its leading players, Ricardo Garza, to become a manager, they dispatched him to Vero Beach in the spring of 1965 to study the Dodger methods of training and managerial strategy. Other international visitors to Dodgertown in the 1960s included Mexican League executive and former Cleveland Indians’ infielder Bobby Avila; the Cuban Winter League’s Bobby Maduro was a frequent Dodgertown visitor, along with representatives of the Alemendares Club. In January 1966, O’Malley predicted the major leagues would one day expand into Canada. The Dodgers operated their minor league affiliate in Montreal until 1960. “I think we’ll see somebody bring a franchise into Toronto or Montreal,” he said. “The Canadian market is wide open. If international politics stabilize, we could see a team some place in Central America. And with the advances being made in transportation, maybe in Japan, too. You can already fly from the United States to Tokyo in less time than it used to take the Dodgers to go from Brooklyn to St. Louis by train. O’Malley outlined his ideas on major league expansion in a March 1968 interview with Los Angeles Times sports editor Paul Zimmerman. Within a year, major league baseball would switch to divisional format and introduce a League Championship Series, which doubled the postseason participants from two to four teams. The N.L. would welcome the expansion Montreal Expos and San Diego Padres in 1969. But the focus in spring training 1968 centered on whether the N.L. would expand from 10 to 12 teams like its American League counterparts. The candidates included Dallas-Fort Worth, San Diego, Buffalo, Montreal and Milwaukee. 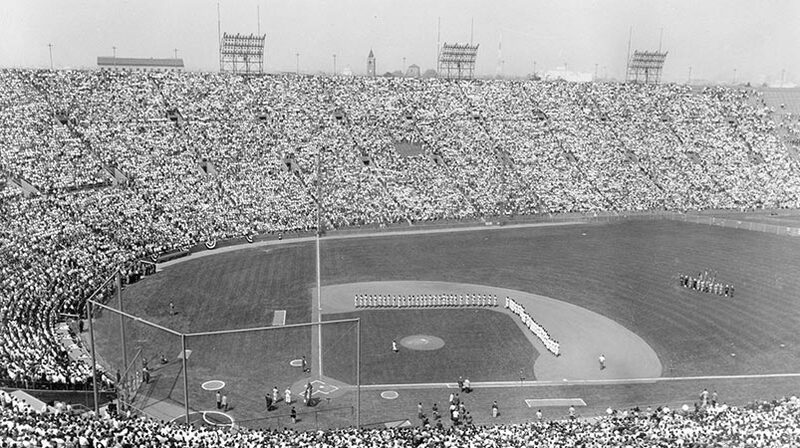 Those discussions indicated the success and increasing popularity of the sport following the Dodgers’ and Giants’ historic move to California. In 1957, there were no major league teams on the West Coast. An expansion team for San Diego in 1969 would give California five major league teams — the Dodgers, Angels, Athletics, Giants and Padres. “Would you have Major League Baseball on the coast without the airplane? The answer is no,” O’Malley said. O’Malley speculated there were at least two cities in Japan ready to support a major league franchise using the following criteria — stadium, player talent, economic backing, public enthusiasm and great support from the press. “Japan has an abundance of talent, an area in which we in the United States are short,” he said. “They can field one or two teams right now that can beat at least half our teams.